New head coach Tony Pulis says his record of never being relegated as a manager does not guarantee West Brom's survival in the Premier League. Pulis took over on Thursday, following Alan Irvine's sacking, and was in the stands on New Year's Day as the Baggies drew 1-1 with West Ham. 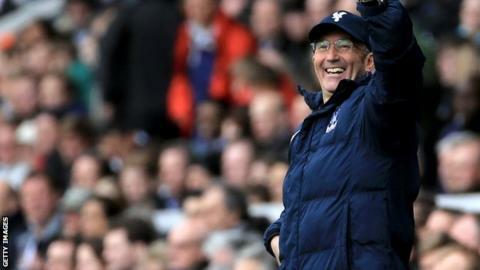 "Irrespective of my record, everyone is fighting to stay in the Premier League," said Pulis. "Just because I've walked in, it does not mean the club will stay up." West Brom are 17th in the Premier League, one point clear of the drop zone with 18 games remaining. Pulis, with 22 years of managerial experience under his belt, proved last season that he can turn the fortunes of a struggling club around. Bournemouth, 1992-1994: Gillingham, 1995-1999: Bristol City, Jul 1999-Jan 2000: Portsmouth, Jan 2000-Oct 2000: Stoke, 2002-2005: Plymouth, 2005-2006: Stoke, 2006-2013: Crystal Palace, Nov 2013-Aug 2014. The 56-year-old joined Crystal Palace in November 2013 with the Eagles in the bottom three. A strong second half of the campaign saw them finish 11th and survive a season in the Premier League for the first time. "There is a lot of work to be done," said Pulis. "To do that, we need the support of everybody. The Hawthorns rocks when the support is behind the team so we need to get that going again. "You have to find a way to win games with what you have and work on a system that will suit the players. "I hope we can use the transfer window to our advantage and bring a few players in, which we need to. Then we go from there." Pulis added that he will be in the stands for West Brom's FA Cup third-round match against Gateshead on Saturday, but will head down to speak to the players at half-time.